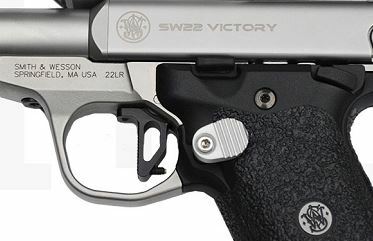 The SW22� Victory� is a popular rimfire pistol for Rimfire Challenge, Steel Challenge and other shooting sports competitions, and is great for beginner and junior shooters. But for young shooters, or other shooters with smaller hands, reaching the magazine release button while shooting can be a challenge. Even shooters with larger hands often struggle to easily and consistently release the magazine when adding thicker SW22� grips to their Smith & Wesson Victory� pistol. The TANDEMKROSS "Titan" Extended Magazine Release for SW22� Victory� is a simple, drop-in replacement for the factory magazine release that offers significantly more surface area and height to make magazine changes easy - ideal for competition shooters! The extended magazine release features a unique, paddle button to extend the magazine release not only out and away from the gun, but also back toward the shooter. The paddle is textured for a no-slip grip in any condition, and can be positioned by the user for a customized grip. The magazine release button is available in black or silver for further customization.